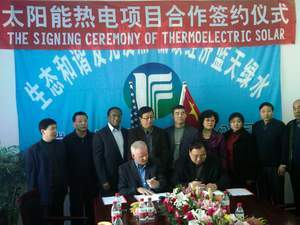 ARVADA, CO--(Marketwire - March 3, 2011) - SkyFuel has signed an agreement for the construction of a 50 MWe concentrating solar power (CSP) plant at a site near Huludao in China. The plant will use SkyFuel's advanced, low-cost parabolic trough concentrating solar collector (the SkyTrough®) to supply heat to a standard steam driven power plant. The agreement was signed with Project Developer Huludao Ruixinda Industry Co., the State-owned Assets Supervision & Administration Commission (SASAC), and the US-China Economic and Cultural Development Alliance (US-China ECDA). The plant will provide clean, carbon-free electricity to the growing city of Huludao, about 400 km east of Beijing. "We are eager to see clean, renewable power being made for our city of Huludao," said BoHua Wu, President & General Manager of the Huludao Ruixinda Industry Company. "This project will be a showcase for concentrating solar power in China." Together with SASAC and US-China ECDA, SkyFuel is pursuing other opportunities throughout China for bringing dispatchable solar power to meet the rapidly growing need for electricity. Other projects in development include fuel switching of existing fossil-fired power plants with clean solar energy. SkyFuel's parabolic trough, which is the first commercially available, utility scale collector to use lightweight ReflecTech® Mirror Film in place of fragile and heavy glass reflectors, is of particular interest in China because most of the parts can be fabricated in-country. These features, and the ease of installation of the SkyTrough®, also reduce the cost of the solar field by roughly 20%. "We are very excited to have this opportunity to provide the solar collectors for Huludao," commented Kelly Beninga, SkyFuel's Chief Commercial Officer. "This is a first step into a new market that holds great promise for SkyFuel". Utility scale parabolic trough solar concentrators harness the sun's energy to make steam for electricity generation. Patterned after the best of previous, time proven designs, the SkyTrough® is a breakthrough in cost and constructability resulting from significant design and material innovations. The SkyTrough® is the first utility scale solar concentrator to employ lightweight ReflecTech® Mirror Film, developed collaboratively by SkyFuel and NREL, in place of the fragile glass mirrors traditionally used. SkyFuel's wholly owned subsidiary, ReflecTech, Inc., holds the exclusive license to manufacture and market ReflecTech® Mirror Film. SkyFuel is also developing next-generation, high-temperature parabolic trough and linear Fresnel systems. About this company SkyFuel, Inc.